There are two main classifications of exercises: compound exercises and isolation exercises. In this post, we will cover exactly what a compound exercise is. A compound exercise is one that uses multiple muscle groups at the same time to perform a movement. A good example of a compound exercise is the squat; it uses many muscles in the legs and lower body, such as the quadriceps, hamstrings, calves, glutes as well as engaging the core and lower back. Isolation movements, on the other hand, tend to focus on a single muscle or muscle group. A bicep preacher curl, for example, would focus almost entirely on the bicep, and in just one plane of movement. Compound exercises are prescribed to athletes, as they replicate movements that are more natural and ensure the athlete is training as efficiently as possible. 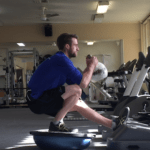 Take the squat again; it is replicating the movement for standing up, driving forward, jumping and many other movements you might see in sports or real life, with each muscle getting attention during the movement. Allows you to lift heavier weights and build overall strength more quickly. If you are looking to improve your overall strength, and get in an efficient and functional workout, then one full of compound exercises will certainly give you what you need. If you have goals that are more specific or requirements, then isolation can often be more suitable. A program that incorporates both types of movements can be highly beneficial, with compound movements forming the foundation of the workout and isolation exercises added on top to target specific muscle groups.